A lot of hullabaloo on how yayas and helpers are treated were brought up in the past month. I was recently interviewed in a mommy magazine on how we should deal with them. My answer was to treat them as people. Yayas, helpers, kasambahays, or however they are called are still human beings like us. They deserve the same respect and love that we give to others. I know of a lot of people who complain about abusive and disrespectful behavior from their helpers. I, too, have been a victim of these kinds of people. But, again, to that I say, we cannot generalize. I have had my yaya for two years plus now and the ride with her (like any relationship) is not perfect. We have gotten into arguments before. She has gotten into arguments with my husband. But, what I think led her to stay is that we treated her fairly and we treated her with respect. We treated her like how we would treat a family member. We love our yaya and I hope she stays with us. During her stay, I have had her attend workshops before so that she could increase her knowledge. I believe that even our helpers should be given the opportunity to grow as individuals. They should be given the opportunity to learn more about what they do best or even about things that would make their life comfortable. 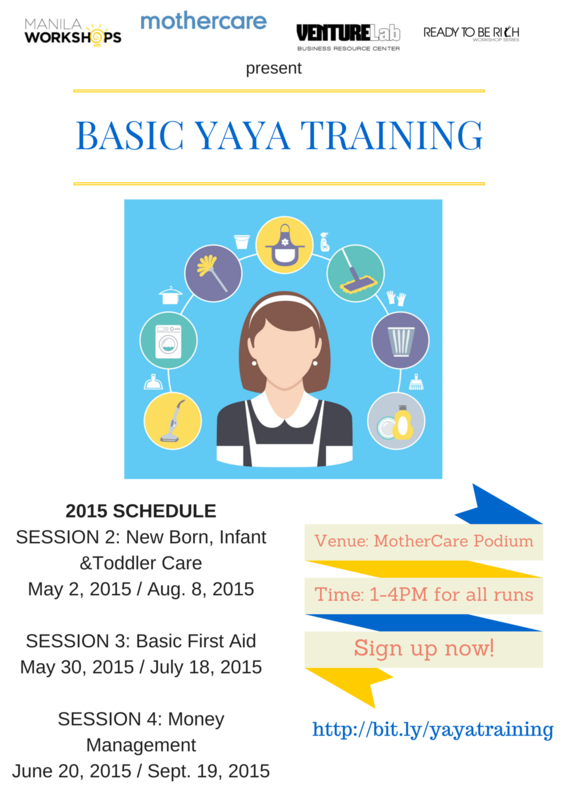 With this, I invite you to sign them up for the Basic Yaya Workshops for 2015. These sessions are brought to you by Manila Workshops, VentureLab, Mothercare and Ready to be Rich. First Episode of GTV! Let’s all Love the Leap! I have launched my own YouTube channel last April 8! Yehey! I, of course, forgot to tell you, my dear MommyGinger.com readers. I have just been so busy lately. How busy? I hibernated yesterday (that busy!). I slept at 6pm and got up at 9 am the next day. I haven’t slept like that ever — EVER! But anyway, back to the topic. This is something that is very, very important to me. I’m so happy that I have finally launched it! I have prepared for a very long time for this. I didn’t expect that creating videos can take so much time and effort. I thought it was just something like uploading a video from my phone, but since we (the team) want to give you great content, we took the time to edit it and make it really informative. I know how hard it is to finally take that leap into entrepreneurship. It takes a lot of guts and planning. I know that for those who do not have experience handling a business or for those who didn’t get to have any business subjects back in college, this would even be harder. I created GTV so that I can share with you my experiences and so that other people can also share what they have learned and share their own experiences, too. Here is episode 1 of GTV Channel where I talk about the purpose of GTV. I hope that you can subscribe to GTV Channel (http://bit.ly/gtvchannel) and please tell your friends about it! Also, please comment on this page and leave questions that you would want me to answer in one of the videos. Also, if you want to be featured or if you want your brand to be featured, please contact me at contact@gingerarboleda.com. It is so hot these days! This morning, I took a taxi to go to a coffee shop that was just few blocks away. I could have walked, but I didn’t want to feel icky for that meeting. I avoid going out of the house to go to banks, meetings, etc. I miss those days when I was still working when you could just ask “manong” or service staff to run errands for you. But of course, since my business can’t afforf to hire anyone to do those errands, little ol’ me needs to do these things personally. I was just thinking about this dilemma this morning and then viola! 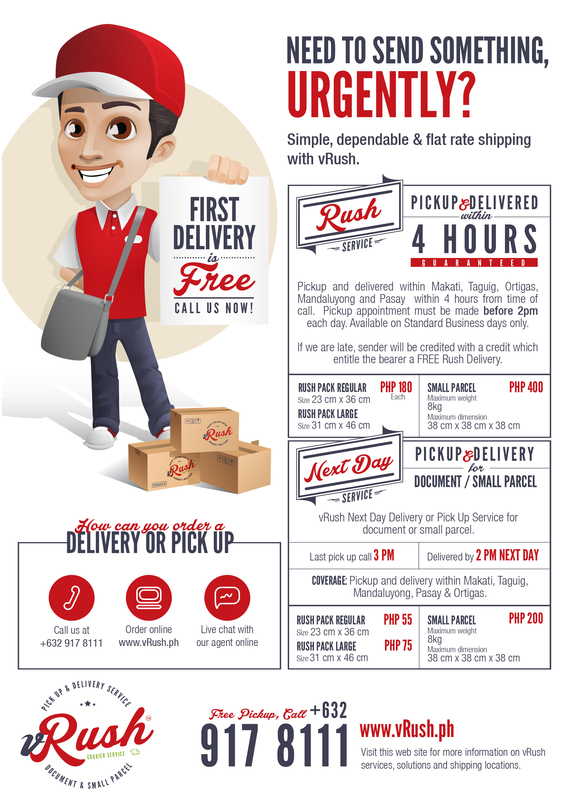 Just like a message from heaven, vOffice emails me to tell me of this service where you can actually have your very own courier service, and it’s called vRush. This service is being offered to vOffice Philippines clients as an extra service within vOffice. It is also being offered to non-clients already. For more details, this brochure can give you more information on vRush! I love all the perks and the additional services that the vOffice team comes up with to make our lives as entrepreneurs and business owners better and more convenient. If you are not yet a member, sign up using the link on this page (http://voffice.com.ph/jumpstart-gingerarboleda/) and get an additional 2 months (valued at Php 7,840) when you signup for any Virtual Office plan today. 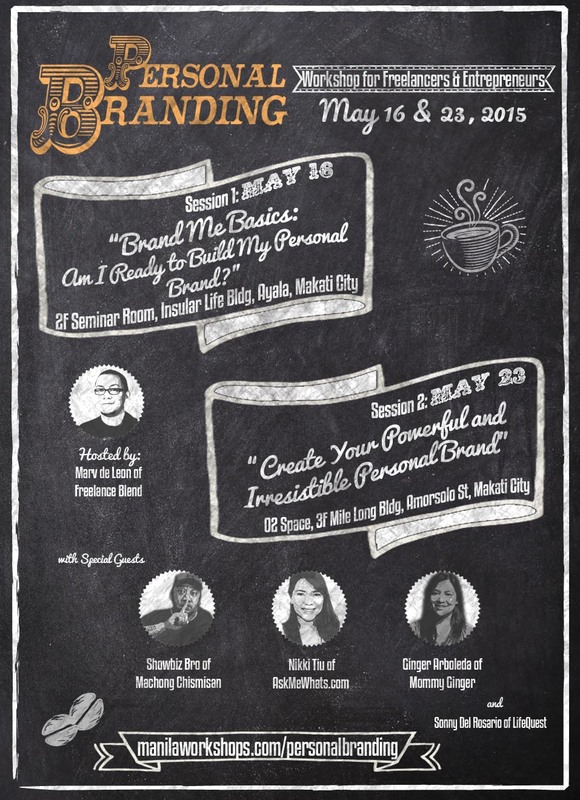 Brand Yourself — Personal Branding Workshop! I have been asked by a lot of bloggers and freelancers on how I get to successfully bring in brands for my site and for my business. Recently, I have signed up for three brands as a digital endorser. This is aside from the other projects that I have with other brands. Do you want to know the secret? Well, one of the secrets is to really build a good and solid PERSONAL BRAND. 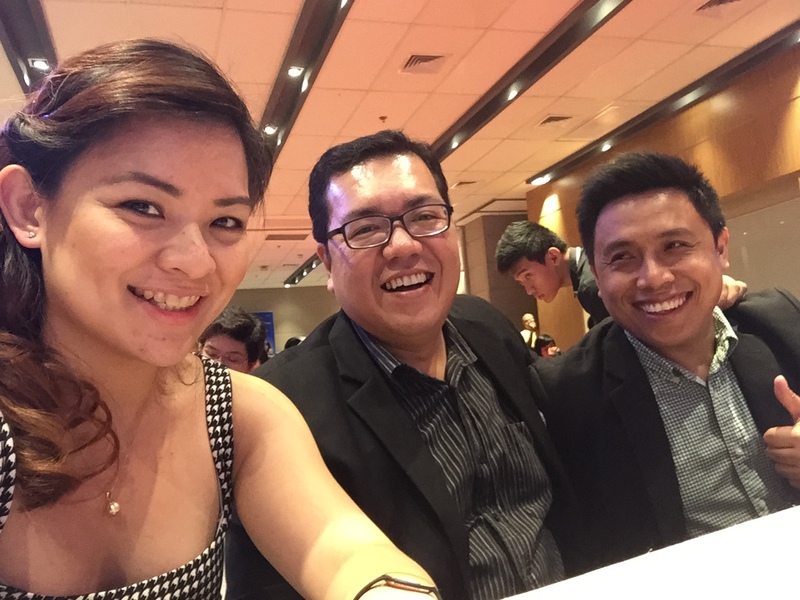 I have built my brand as an as an entrepreneur, business and marketing coach, because it is what was in line with my dream of helping build businesses here in the Philippines. Personal branding does not just mean creating a great logo or knowing what your blog is about or what services will you offer as a freelancer or as a small business. It goes beyond that. You and your business or the services that you render are connected and you cannot separate who you are as a person with what you want to do. It makes sense and it can even make you more successful if you build on something that you are passionate about and this is where all the tips about doing what you are passionate about comes from. It’s easier to build your personal brand if you are pursuing something that you love and something that you want to do for the rest of your life! 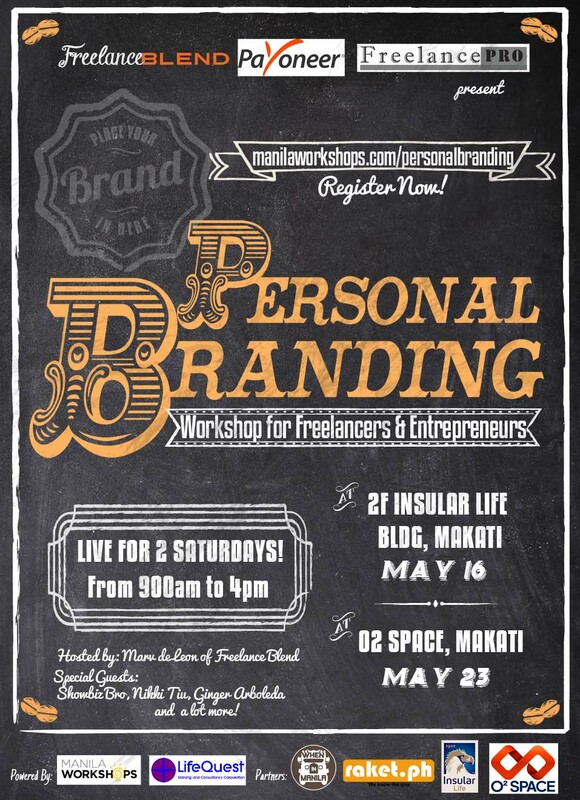 I highly recommend that you sign up for the Personal Branding workshop this May 16 and 23. You can opt to attend just one of the two classes but of course, you will benefit more if you attend both classes. On the second day, May 23, I will be sharing the brand story of Manila Workshops and will be a part of the panelist together with my good friend Nikki Tiu of AskMeWhats.com and of course, the famous Shobiz Bro. I hope that you can attend this workshop. I know that you will really learn a lot from this! If you have branding questions, feel free to leave a comment below! I think that each one of us should have a personal mission — a mission that would eventually make the world a better place. My mission of helping people launch their own successful businesses, I believe, goes hand-in-hand with the group that I recently joined. 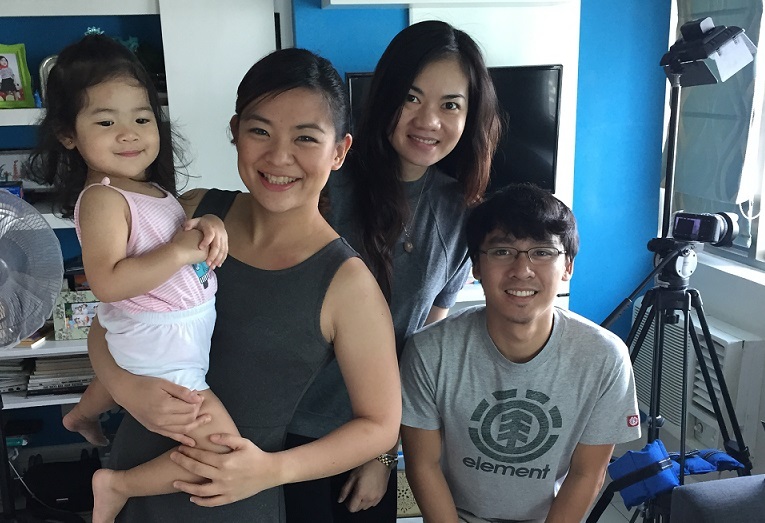 This group’s mission is to spread the word on saving and smartly investing money. 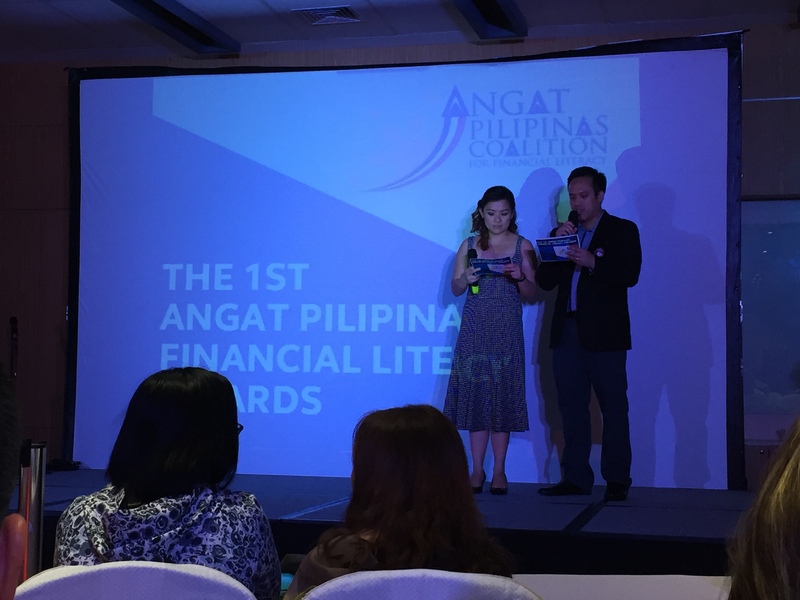 This group is called Angat Pilipinas Coalition for Financial Literacy. 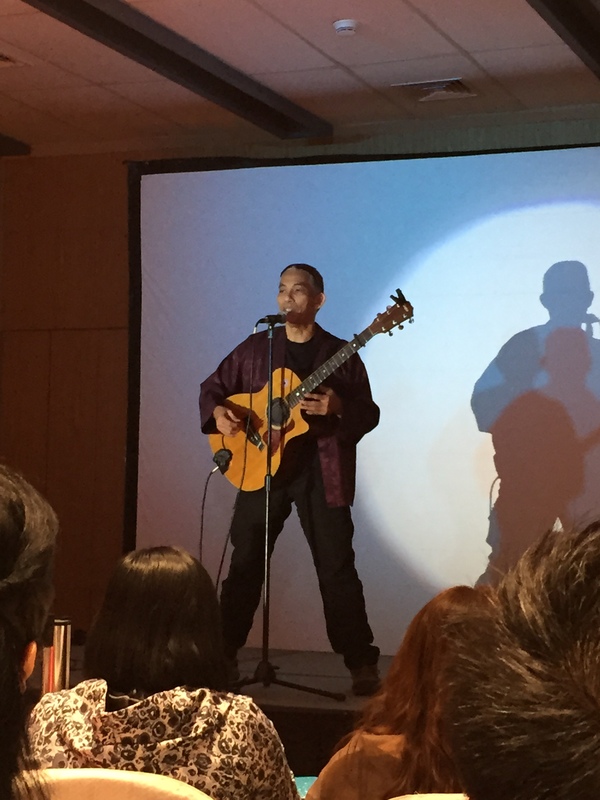 This group aims to start with educating three segments of our society: OFW families, the creative professionals and student and youth groups. I believe that understanding how to intelligently handle your money helps in fulfilling that dream of creating a successful business. I think that those who know how to handle their money well will have an advantage because of a trait that these people possess. I think these people possess the discipline that is required of them. Personally, I think that a big chunk of what made people succeed is discipline. It takes a lot of self-motivation and control for you to be disciplined enough to follow a saving pattern that will eventually get you to that financial goal that you want to achieve. It also takes the same attitude to get you to start and continue with the business that you want to get into. I have seen a lot of guides on how much to save, when to save, where to save, etc. We even have financial workshops that help you understand all these concepts and terms, but what I saw and what I keep on noticing is that those who have that drive and motivation and discipline to keep at whatever it is that they want to do are those that succeed. A big part in keeping people motivated is getting support from the people around them. If you really plan to start a business or save up or invest regularly, it’s good to surround yourself with individuals who will inspire you and motivate you. 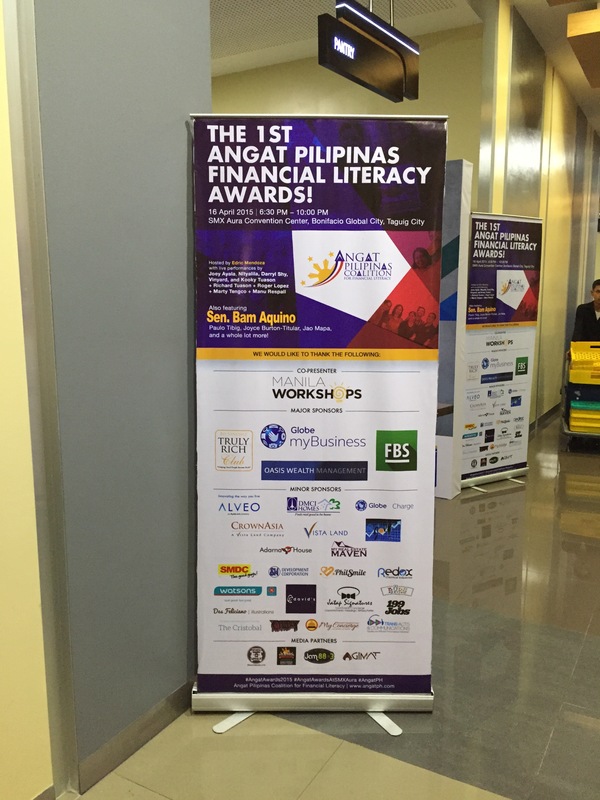 Angat Pilipinas is one group that you can join. I have made great friends in this organization and I wish them more success in achieving their mission! 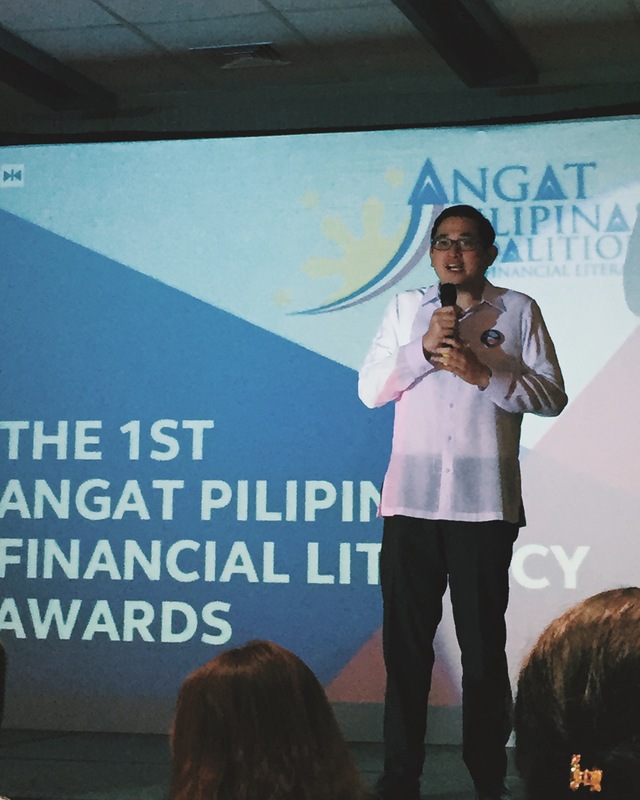 Thank you for inviting me to be one of your Advocacy Consultants and a presenter for the first Angat Pilipinas Financial Literacy Awards night!